Vitrine manifests itself in two ways in retail applications: the Object Vitrine and the Store Vitrine. Object Vitrine is a traditional, museum-style glass showcase that is used in retail interiors for displaying small and medium-sized products. On a larger scale, Store Vitrine occurs when a primarily glass façade frames unobstructed views into a store and places the shop interior itself on display. This elevation of status is important for both museum and retail applications. In natural history and anthropological museums, vitrines are used to protect and preserve significant artifacts, as well as to frame everyday objects from another time or place in order to provoke consideration for the meaningful stories the objects have to tell. Retailers similarly use Vitrines both for securely displaying high-ticket items and displaying less expensive items in a manner that creates the illusion of importance. Although multiple objects may be displayed together in the same vitrine, there is a functional difference in the retail setting between a Vitrine that "museumizes" the contained objects and glass display cases used primarily for security purposes. In the early days, glass showcases served not only as a practical display technique, but as an important demonstration of success and technology. These display cases did not have panels of glass on multiple sides as would become a defining characteristic for later iterations of Vitrine, but these early applications of glass as a material for retail display are undoubtedly important. The Pitt Rivers Museum, an ethnological and anthropological museum founded in Oxford, England in 1884, is known for its iconic use of the multi-faceted glass Vitrine rather than the glass-fronted or glass-topped displays found earlier. The main gallery in the museum consisted of a tightly-packed arrangement of Vitrines, containing various collections of objects. Although a museum, Vitrine's use and effect in this context informs the understanding of its retail applications. The museum was founded by and named after Lieutenant-General Augustus Henry Lane Fox Pitt Rivers after his growing collection of firearms, weapons and other material culture objects outgrew his home. Inspired by his initial firearms collection, Pitt Rivers was fascinated by the ability to track and evaluate an object's evolution by arranging a collection of objects from simple to increasingly complex forms. To demonstrate this evolutionary process, objects were often grouped together in the Vitrines rather than being displayed individually. "When a group of objects is exhibited together in a vitrine, a kind of visual construction or statement is involved, suggesting that they have some formal relationship or cultural relationship one with another. "3 The arrangement oftentimes became a taxonomy, or formal classification. Another lesson to be learned from the Pitt Rivers Museum's use of Vitrine is in the representation of ordinary objects. As an anthropological museum, "the Pitt Rivers Museum has always made a practice of collected 'ordinary typical specimens' although it also possesses many objects of rarity, beauty and value." Many of the objects in their collection are material culture artifacts rather than works of art, but the Vitrine becomes a vehicle for presenting the artifacts in a context that forces consideration of their importance and "relationships between people and things. "5 Retail undeniably borrows this power of the Vitrine. For retail, isolation of a product in a Vitrine is important for inviting customers to admire products on display. The ability to look but not touch has even more extreme psychological implications in the retail setting than in a museum, given the consumerism and materialism associated with shopping. Unlike museums, there is a fascinating tension in retail between the Vitrine's portrayal of an object as unattainable and the reality that the observer can attain the object if so desired (finances permitting). This cultivation and satiation of desire is partially due to Vitrine's ability to highlight the aesthetics and physical appearance of displayed objects. Sensitivity to the power and necessity of curated presentation were apparent in late 19th century literature. In commenting on the Berlin Trade Fair in 1896, philosopher Georg Simmel referred to the "shop-window quality of things," noting that the aesthetics and presentation of the objects on display were almost becoming more important than the function and intrinsic value of the objects. "Presentation is everything" became a mantra: "As the surface appearance of the commodity takes precedence, the context in which the products are offered to the consumer logically has to support the image projected." Vitrine was a means for creating an attractive context in which to display an object in addition to drawing attention to the objects' aesthetic value. Simmel's word choice in describing the "shop-window quality" at the Berlin Trade Fair was apropos, given that the late 19th century into the early 20th century was the golden age of the department store, and consequently, the notion of window-shopping. "A profusion of goods, brought from everywhere and piled in luxurious displays, made ‘just looking' at merchandise a popular pastime. "7 Increased attention paid to the design of both interior and window displays facilitated more enjoyable looking, allowing browsing and window shopping to become activities in their own right. Large shop windows fall more under the realm of Store as Vitrine and will be addressed later, but Simmel's reference to retail's then current state of affairs marked an important shift in thinking about the display of goods. Consideration for product display has since remained in the discourse, more recently becoming a topic in the art world. Although there had been a dialogue about the relationship between art and consumer goods since the late 19th century, several artists in the later half of the 20th century directly addressed the themes of consumerism and Vitrines in their works. The combination in the early 1960s of the increasing popularity of boutiques as a new retail typology and Pop Art as the avant garde art movement contributed to alternative perspectives towards Vitrine. In the earlier days of the art community's questioning of consumerism, boutiques were a retailing trend that influenced they way in which product was displayed. Targeted towards younger generations, boutiques made fashion more accessible and used the interior design of their shops as one of the primary means of doing so. Display techniques were informal, with hand-selected clothing and accessories often casually hung or draped over furniture pieces. Kate Spade reflected on the boutique philosophy: "Rather than communicating through a museum-like setting where items are treated in a precious manner and ‘don't touch' is the underlying message, visitors to these boutiques are invited to interact with the merchandise and feel at home. "8 While on one end of the spectrum, retailers were making merchandise appear more valuable and desirable by placing it in Vitrines, the other extreme consisted of the informal display techniques found in boutiques that encouraged customers to interact with the merchandise. Consideration for the art climate in the 20th century also offers insight into Vitrine, especially since artists' work began to challenge the basic notion of Vitrine's use in retail. Marcel Duchamp's Fountain (1917) begged the question of what constituted art, proposing that a mundane object like a urinal could be considered art in the context of a museum. Andy Warhol's prints later furthered the notion of incorporating banal products into art by adding a layer of commentary about society and consumerism, as with his Campbell's Soup (1968) prints or Brillo Boxes (1970). In the 1980s, Jeff Koons made visible the connection between the banal object and Vitrine. In his series entitled The New, he placed Hoover vacuum cleaners in Plexiglas Vitrines. The vacuums were mass-produced, common products displayed as if precious artifacts, much as many products are presented on the market today: "The elevation of consumer goods, the fine appearance of product display and the enticement of new, unused things that we recognise from the displays in the shopping malls, acquire a new reputation and eminence through the transformation of these products into art objects...The cocoon in which they find themselves, is on the one hand a display window and on the other a shield, an enveloping aura, which should protect out-dated models from ageing quickly, giving them eternal newness, security and relevance. "9 While the Vitrine originated to protect and preserve specimens, valuable artworks or historical artifacts, this reiterative trait became a means for increasing the perceived value and status of objects that are mass-produced, as exemplified and challenged by Koons' work. In more recent years, British artist Damien Hirst created works that continued to challenge the notion of the Vitrine. Hirst featured various animals preserved and suspended in formaldehyde in a series of Vitrine-based works, including the infamous shark in The Physical Impossibility of Death in the Mind of Someone Living (1991). His pieces draw more upon the traditional natural history applications of Vitrines but are relevant in underlying intention. "For Hirst, the vitrine functions as both window and barrier, seducing the viewer into the work visually while providing a minimalist geometry to frame, contain, and objectify his subject." Such analysis addresses the basic premise behind Vitrine as a retail design practice. Vitrines offer convenient frames for viewing products and solicit admiration for their contained products, but simultaneously keep viewers at a distance much as Hirst did with his Vitrine projects. Aside from theoretical analyses of the intentions and implications associated with Vitrines, they have had practical applications in the retail interior since their early appearances in 18th century shops. In the beginning of the 19th century, glass fronts were being incorporated into sales counters for the display of smaller items like gloves and fashion other accessories. By the 1850s, carpenters were comfortable with the new millwork and constructed a broad range of showcases made of plate glass and thin frames. Vitrines have since remained a mainstay in retail display techniques. The Vitrine experienced a shift in application during the 1950s as the sales dynamics were transitioning from a full- to self-service model. Stores catering towards self-service were characterized by more open, accessible display fixtures that provided customers with variety and selection so they could help themselves rather than relying on sales associates for personalized customer service.10 This shift in type and level of sales service did not result in a decrease in the use of Vitrine but instead altered the way that designers used them, as will become apparent in the chronological sequence. Since the walls were opaque when occupied, they did not function as vitrines that exhibited people as they undressed. The possibility that the walls could have been transparent, however, and the curiosity incited as a result of this possibility, introduced a voyeuristic element to the notion of Vitrine. Themes of voyeurism and the display of people within vitrines will play a more instrumental role in the discussion of the store as Vitrine. Several years later, Loos incorporated upright vitrines into the Kniže Clothing Store (1910), another of his retail projects.13 Rather than a taxonomy arrangement, these vitrines featured only a few items arranged in a small vignette. The light fixture in the photograph also reads as a sort of vitrine, the light bulbs encased within a multi-faceted pentagonal dome. Both instances of Loos' use of Vitrine were fairly straightforward interpretations of the types of vitrines used in museums. Attention was clearly paid not only to the appropriate scale for the merchandise on display, but in the case of exterior vitrines, to the scale necessary for attracting customers and drawing them into the store. The vitrines in this arcade-style storefront drew customers into the vestibule and led them to a strategic view of the store interior in an early predecessor to Store as Vitrine that hopefully enticed them to enter the store. By the 1940s, Vitrine was better adapted to the needs of the retail environment, rather than being a direct transplant from the museum display aesthetic. The jewelry and handbag department in Messinger's offers an example of this adapted Vitrine.15 The wraparound formation of this vitrine suggests that the salesperson stood in the center and retrieved products that customers wished to inspect from the chest of drawers behind the vitrine, rather than taking the items out from the display case. This type of vitrine still functioned similarly to a taxonomy-style museum vitrine, but its form was modified to support both the customer's easy viewing of the products and the salesperson's administering of service. Martin's Department Store (1943), another project by Morris Lapidus, even better reflects his strategy for sizing vitrines to the products contained within.16 Lapidus used small vitrines sized to each fit only a single pair of shoes. While some shops were adapting Vitrine to support the specific functions of retailing, others leveraged the traditional associations with the vitrine as a merchandising strategy. These vitrines isolated each pair of shoes and framed them as something special, much like objects on display in a museum. The 1940s Guild House was an early specialty shop that experimented with a round Vitrine. Objects were featured in a cascading display within the cylindrical glass Vitrines. The cylinders, however, were not entirely enclosed. There was an opening along the sides of each Vitrine for accessing products inside, meaning that the vitrine did not render the contained goods unattainable as usually is the case. Given that it was difficult to perceive where the glass walls began and ended, the Vitrine made apparent and even challenged the theme of desire and inaccessibility. As will become apparent through the progression of the chronological sequence, Vitrine was also often paired with Marching Order (Intype) as an organizational tool for determining the placement of multiple vitrines in a retail interior. Trends from the previous decade carried through to expressions of Vitrine in the 1950s, as seen in the Carol Antell shop (1952).17 Vitrines were used as multifunctional fixtures, offering enclosed product display while also serving as a sales counter. Experimentation with form continued as well. Carol Antell featured a round vitrine much like the one from the Guild House. Another installation from the 1960s shows an additional example of custom Vitrines catered to the specific retail interior. A camera shop in Milan experimented with spherical form in order to more efficiently display cameras and parts. The form referenced the geometry of a camera's lens and became a motif throughout the store. Vitrine was a strategy for streamlining display in a type of shop often characterized by crowded, chaotic displays. "A trap into which many photographic shops fall- having too many articles on show-was avoided by placing the display items under the Plexiglas domes. This leaves 80% of the room free, and gives the customer the chance to inspect the equipment at close range. "19 In other parts of the store, wall-mounted Vitrines were backlit and used a grid structure to organize the cameras and parts. Neiman Marcus (1978) offers an example of how department stores used Vitrine to display briefcases in the men's luggage department. "‘The store," explained Robert Malderez [the designer] of Eleanor Le Maire, "presents a series of specialty shops-but not boutiques-in a related atmosphere. '"21 Vitrine contributed to an atmosphere of high-quality specialty shops and related all of the departments together through a similar display method. Appearing earlier in the 1970s in The Mechanical Eye, the columnar Vitrine was a recurring motif. It appeared again in the 1980s in the Korean clothing boutique, Troa Cho (1983). The existing building façade had a central post located directly in the center of the shop's entrance. The designer embraced the existing conditions by surrounding the necessary structural post with a glass display case to maximize street-facing display. This treatment was translated and repeated in the store's interior in a series of exaggerated columns, their middles transparent vitrines that highlighted select product.22 The scale of the Vitrines allowed them to become spatial elements. In contrast to Troa Cho's monumental Vitrines, other stores experimented with smaller-scale ones. LeSportsac (1984), a store selling nylon bags and luggage, employed nontraditional Vitrines located near the cash wrap to garner interest in their line of jewelry.23 The combination of the Vitrine's triangular form and varied heights added visual interest and likely served as a distraction while customers waited in line. 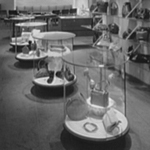 Although Vitrine oftentimes served as a supplementary display technique within the design scheme of the store, such as in the LeSportsac or Neiman Marcus, stores like Troa Cho or Creeks Boutique (1986) demonstrated instances where Vitrines themselves were featured interior elements. [Philippe] "Starck converted the basement into a shoe ‘sanctuary' where each glass-enclosed pair is treated like a jewel on display. "24 The Vitrines acted as the key design element in the shoe section of the boutique. The clear juxtaposition of the single Vitrines in the back and the long display case along the right demonstrated how isolating single pairs of shoes differentiated them from others displayed together in a larger Vitrine. Niessing (1990) offers another example where Vitrine was a dominant design expression in the store.25 This jewelry store used smaller-scale cubes for a nontraditional approach. The Vitrines, arranged in Marching Order, replaced the traditional bands of display cases that frequently serve the added function of a sales counter. Instead of placing customers opposite salespeople on the other side of the counter, these Vitrines were arranged against the walls. They also isolated products in smaller groupings, which allowed customers to experience the merchandise sequentially, in smaller segments. The column Vitrine remained in constant use, appearing again in the 1990s in Canadian department store Holt Renfrew (1994).26 This oversized Vitrine isolated a single pair of shoes in a design decision that could be interpreted as a strategy for identifying the shoe department; the Vitrines marked the entrance to the shoe department and guided circulation in on either side. In 1997 Niketown featured an alternative interpretation of a columnar Vitrine. Cylindrical Vitrines were embedded at eyelevel within a Split Column (Intype) and displayed rotating sneakers. These Vitrines were reminiscent of the scientific origins of Vitrines as vessels for preserving and viewing specimens. Nike used their retail environments to tell the story of the brand, functioning almost as an exhibit.27 With that goal in mind, Vitrine was one strategy for storytelling in an exhibit-like fashion. In a more rectilinear form, the Vitrines in Alexander McQueen's London flagship (2000) also referenced scientific Vitrines.28 These clear acrylic ones protruded from the colored wall plane, isolating small objects and accessories within each one. The high-contrast between the yellowish light in the Vitrines and the dark green wall called further attention to the products on display. Throughout history, Vitrine has commonly appeared either as a singular display element in a retail interior (Messinger's, Holt Renfrew, Christian Dior), arranged in Marching Order as a means of spatial organization (Mantellassi, Niessing, Nike), or been experimented with in an innovative way (the Milanese camera shop, LeSportsac, D'Fly). 1) Marta Mendez, "Theory Studies: Archetypical Practices of Contemporary House Design," (M.A. Thesis, Cornell University, 2008), 98-115; Joori Suh, "Theory Studies: Contemporary Museum and Exhibition Spaces," (M.A. Thesis, Cornell University, 2003), 121-24; Leah Scolere, "Theory Studies: Contemporary Retail Design," (M.A. Thesis, Cornell University, 2004), 53-57. 2) James Putnam, Art and Artifact: The Museum as Medium (London: Thames & Hudosn, 2009), 36; Claire Walsh, "Shop Design and the Display of Goods in Eighteenth-Century London," Journal of Design History 8, no. 3 (1995): 162-64; Freibourg & Treyer [c1780] Anonymous Architect; London, England in Claire Walsh, "Shop Design and the Display of Goods in Eighteenth-Century London," Journal of Design History 8, no. 3 (1995): 157-76; PhotoCrd: British Museum, Heal Collection. 3) Walsh, "Shop Design and the Display of Goods," 162-63; Interior, Pitt Rivers Museum  Thomas Newenham Deane and Benjamin Woodward; Oxford, England in Charles Gosden, Frances Larson with Alison Petch, Knowing Things: Exploring the Collections at the Pitt Rivers Museum 1884-1945 (Oxford: Oxford University Press, 2007), 2; PhotoCrd: Pitt Rivers Museum Collection; Putnam, Art and Artifact, 8-9; Beatrice Blackwood, The Classification of Artefacts in the Pitt Rivers Museum Oxford (Oxford: Oxford University Press, 1970), 7. 4) "Vitrine de Référence"  Christian Boltanski in Putnam, Art and Artifact, 16; PhotoCrd: Courtesy of Galerie Ghislaine Hussenot, Paris, ADAGP, Paris and DACS, London 2001; "Beuys Block: View of Room 3,"  Joseph Beuys in Putnam, Art and Artifact, 17; PhotoCrd: Sina Althöfer, Courtesy of Hessiches Landesmuseum, Darmstadt, DACS 2001; Tiffany & Co.  Cross & Cross, Renovated by Haines Lundberg Waehler; New York City in Kristen Richards, "The Sparkle of Quality: With A Passion for Excellence, Tiffany & Co. Proves Fine Design Comes Wrapped in a Blue Box," Interiors 150, no. 5 (May 1991): 120-31; PhotoCrd: Elliott Kaufman; Marni  Sybarite; Tokyo in Benjamin Budde, "Sybarite's Delight: At the Marni Boutique in Tokyo, Sybarite UK Played With Bewitching Signature Elements," Interior Design 78, no. 12 (Oct. 2007): 262-69; PhotoCrd: Jimmy Cohrssen. 5) Blackwood, The Classification of Artifacts, 8; Chris Gosden, Larson and Petch, Knowing Things, 8. 6) Valerie Casey, "The Museum Effect: Gazing from Object to Performance in the Contemporary Cultural-History Museum," Paper presented at ICHIM '03: The Seventh International Cultural Heritage Informatics Meeting, Paris, France (September 8-12), 2003; 3; Putnam, Art and Artifact, 37. 7) Christoph Grunenberg, "Wonderland: Spectacles of Display from the Bon Marché to Prada," Christoph Grunenberg and Max Hollein, Shopping: A Century of Art and Consumer Culture (Ostfildern-Ruit: Hatje Cantz, 2002), 19; Sharon Zukin, Point of Purchase: How Shopping Changed American Culture (New York: Routledge, 2004), 20. 8) Kate Spade, "Foreword," Susan Abramson and Marcie Stuchin, Shops & Boutiques 2000: Designer Stores and Brand Imagery (Glen Cove, N.Y: PBC International, 1999), 9. 9) Michael Lüthy, "The Consumer Article in the Art World: On the Para-Economy of Pop Art," Grunenberg and Hollein, Shopping, 148; "New Shelton Wet/Drys 10 Gallon, Double Decker," Jeff Koons, http://www.jeffkoons.com/site/index.html. (accessed April 17, 2011); Max Hollein, "The Glamour of Things," Grunenberg and Hollein, Shopping, 203-204. 10) "Damien Hirst," White Cube, http://www.whitecube.com/artists/hirst/ (accessed April 15, 2011); Bill Lancaster, The Department Store: A Social History (New York: Leicester University Press, 1995), 51; Hrant Pasdermadjian, The Department Store: Its Origins, Evolution and Economics (New York: Arno Press, 1976), 178-79. 11) Carolyn Thomas de la Peña, "Ready-to-Wear Globalism: Mediating Materials and Prada's GPS," Winterthur Portfolio 38, no. 2/3 (2003): 121; Thomas de la Peña, "Ready-to-Wear Globalism," 119. 12) Goldman & Salatsch  Adolf Loos; Vienna, Austria in Panayotis Tournikiotis, Adolf Loos (New York: Princeton Architectural Press, 1994), 42; PhotoCrd: Das Interieur; Tournikiotis, Adolf Loos, 40. 13) Kniže Clothing Store  Adolf Loos; Vienna, Austria in Panayotis Tournikiotis, Adolf Loos, (New York: Princeton Architectural Press, 1994), 46; PhotoCrd: Gerlach Photo-Studio. 14) Postman's  Morris Lapidus; New York City in Deborah Desilets, Morris Lapidus: The Architecture of Joy (New York: Rizzoli, 2010), 122; PhotoCrd: Morris Lapidus Archives; Morris Lapidus, An Architecture of Joy, 84. 15) Messinger's [c1930] Jose A. Fernandez; New Rochelle, NY in Fernandez, The Specialty Shop, 229; PhotoCrd: Gottscho-Schleisner. 16) Martin's Department Store  Morris Lapidus; Brooklyn, NY in Martina Düttmann and Friederike Schneider, eds., Morris Lapidus: Der Architekt des Amerikanischen Traums (Morris Lapidus: The Architect of the American Dream) (Basel: Birkhäuser, 1992), 52; PhotoCrd: Morris Lapidus Archives. 17) The Guild House [ca. 1940s] Carson & Lundin, Architects; Harry E. Davidson & Son, Architects; Boston, MA in Fernandez, The Specialty Shop, 122; PhotoCrd: Gottscho-Schleisner; Carol Antell  Seymour R. Joseph, Joseph and Vladeck; New York City in Anonymous, "Expanding Store Creates Design Problem," Architectural Record 111, no. 2 (Feb. 1952): 156-62; PhotoCrd: Ben Schnall. 18) Mantellassi [c1960] Pierluigi Spadolini; Florence, Italy in Kaspar, Shops and Showrooms, 33-35; PhotoCrd: Anonymous. 19) Unidentified Camera Shop) [c1960] Joe Colombo; Milan, Italy in Kaspar, Shops and Showrooms, 90-93; PhotoCrd: Anonymous. 20) Mechanical Eye  Oliver/Breyer Design Associates; Kansas City, MO in Anonymous, "Crown Center Retail Complex: A Pot-Pourri of Stores and Boutiques by Oliver/Breyer Design Associates," Interior Design 45, no. 6 (Jun. 1974): 92-97; PhotoCrd: Alexandre Georges; Anonymous, "Crown Center Retail Complex," 93. 21) Neiman Marcus  Eleanor Le Maire Associates, Inc.; Washington D.C. in Anonymous, "Neiman-Marcus/Washington: N-M's First Full-Service Store on the East Coast Designed by Eleanor Le Maire Associates, Inc.," Interior Design 49, no. 7 (Jul. 1978): 106-11; PhotoCrd: Mark Ross. 22) Troa Cho  Alfredo De Vido; New York City in J.G.T., "Playful Enterprise: Architect Alfredo De Vido Converts the Ground Floor of a 19th-century Manhattan Townhouse into a Clothing Boutique," Interior Design 54, no. 9 (Sept. 1983): 254-55; PhotoCrd: Paul Warchol. 23) LeSportsac  Carr & Associates; New York City in A.L., "LeSportsac: Carr & Associates Increases Sales in a Small Greenwich Village Boutique," Interior Design 55, no. 2 (Feb. 1984): 210-11; PhotoCrd: Sandra Williams. 24) Creeks Boutique  Philippe Starck; Paris, France in Karen D. Stein, "In the Pink," Architectural Record: Record Interiors 174, no. 9 (Mid-Sept. 1986): 128-33; PhotoCrd: Tom Vack with Corrine Pfister. 25) Niessing  Toshiko Mori, AIA; New York City in Edie Lee Cohen, "Niessing: On Madison Avenue, a New Genre of Jewelry Store by Toshiko Mori, AIA," Interior Design 61, no. 12 (Sept. 1990): 186-89; PhotoCrd: Peter Paige. 26) Holt Renfrew  Naomi Leff; Calgary, Canada in Edie Cohen, "Naomi Leff: With Updated Shops Throughout Canada and a New Store in Calgary, Holt Renfrew Reclaims Its High Fashion Status," Interior Design 65, no. 4 (Mar. 1994): 122-27; PhotoCrd: John Hall. 27) Niketown  Nike Design Team (architectural, media, and conceptual design); Brian McFarland, Michael LeClere; BOORA Architects; New York City in Virginia Kent Dorris, "Nike's Flagship Store Integrates Architecture into an All-Encompassing Brand-Reinforcing Experience," Architectural Record: Record Interiors 185, no. 3 (Mar. 1997): 100-103; PhotoCrd: Steve Hall, Marco Lorezetti/Hedrich-Blessing. 28) Alexander McQueen  Azman Owens; London, England in Suzanne Trocmé, "Metamorphic McQueen: Azman Owens Creates a Flexible, Theatrical Stage Set for Designer Alexander McQueen's First Freestanding Store in London," Interior Design 71, no. 5 (Apr. 2000): 172-83; PhotoCrd: Keith Collie. 29) D'Fly  Kevin C. White Architects; New York City in Leanne B. French, "Nuanced Lighting at D'Fly in New York City Casts a Glow Upon Jewelry in a Sleek Setting Fit for James Bond," Architectural Record 190, no. 11 (Nov. 2002): 238-42; PhotoCrd: James Wilkins. 30) Christian Dior 2008] Peter Marino Architect; Paris, France in Mallery Roberts Morgan, "Dior, J'Adore: Peter Marino Updates the Original Paris Boutique with Elegance-and Cheek," Interior Design 79, no. 2 (Feb. 2008): 162-69; PhotoCrd: Jimmy Cohrssen. 31) Evidence for the archetypical use and the chronological sequence of Vitrine as Object in retail design was developed from the following primary sources: 1700 Freibourg & Treyer [c1780] Anonymous Architect; London, England in Claire Walsh, "Shop Design and the Display of Goods in Eighteenth-Century London," Journal of Design History 8, no. 3 (1995): 157-76; PhotoCrd: British Museum, Heal Collection / 1880 Goldman & Salatsch  Adolf Loos; Vienna, Austria in Panayotis Tournikiotis, Adolf Loos (New York: Princeton Architectural Press, 1994), 42; PhotoCrd: Das Interieur; Tournikiotis, Adolf Loos, 40 / 1900 Interior, Pitt Rivers Museum  Thomas Newenham Deane and Benjamin Woodward; Oxford, England in Charles Gosden, Frances Larson with Alison Petch, Knowing Things: Exploring the Collections at the Pitt Rivers Museum 1884-1945 (Oxford: Oxford University Press, 2007), 2; PhotoCrd: Pitt Rivers Museum Collection / 1910 Kniže Clothing Store  Adolf Loos; Vienna, Austria in Panayotis Tournikiotis, Adolf Loos, (New York: Princeton Architectural Press, 1994), 46; PhotoCrd: Gerlach Photo-Studio / 1930 Messinger's [c1930] Jose A. Fernandez; New Rochelle, NY in Fernandez, The Specialty Shop, 229; PhotoCrd: Gottscho-Schleisner; Postman's  Morris Lapidus; New York City in Deborah Desilets, Morris Lapidus: The Architecture of Joy (New York: Rizzoli, 2010), 122; PhotoCrd: Morris Lapidus Archives; Morris Lapidus, An Architecture of Joy, 84 / 1940 The Guild House [c1940] Carson & Lundin, Architects; Harry E. Davidson & Son, Architects; Boston, MA in Fernandez, The Specialty Shop, 122; PhotoCrd: Gottscho-Schleisner; Martin's Department Store  Morris Lapidus; Brooklyn, NY in Martina Düttmann and Friederike Schneider, eds., Morris Lapidus: Der Architekt des Amerikanischen Traums (Morris Lapidus: The Architect of the American Dream) (Basel: Birkhäuser, 1992), 52; PhotoCrd: Morris Lapidus Archives / 1950 Carol Antell  Seymour R. Joseph, Joseph and Vladeck; New York City in Anonymous, "Expanding Store Creates Design Problem," Architectural Record 111, no. 2 (Feb. 1952): 156-62; PhotoCrd: Ben Schnall / 1960 Mantellassi [c1960] Pierluigi Spadolini; Florence, Italy in Kaspar, Shops and Showrooms, 33-35; PhotoCrd: Anonymous; Unidentified Camera Shop) [c1960] Joe Colombo; Milan, Italy in Kaspar, Shops and Showrooms, 90-93; PhotoCrd: Anonymous / 1970 "Beuys Block: View of Room 3,"  Joseph Beuys in Putnam, Art and Artifact, 17; PhotoCrd: Sina Althöfer, Courtesy of Hessiches Landesmuseum, Darmstadt, DACS 2001; Mechanical Eye  Oliver/Breyer Design Associates; Kansas City, MO in Anonymous, "Crown Center Retail Complex: A Pot-Pourri of Stores and Boutiques by Oliver/Breyer Design Associates," Interior Design 45, no. 6 (Jun. 1974): 92-97; PhotoCrd: Alexandre Georges; Anonymous, "Crown Center Retail Complex," 93; Neiman Marcus  Eleanor Le Maire Associates, Inc.; Washington D.C. in Anonymous, "Neiman-Marcus/Washington: N-M's First Full-Service Store on the East Coast Designed by Eleanor Le Maire Associates, Inc.," Interior Design 49, no. 7 (Jul. 1978): 106-11; PhotoCrd: Mark Ross / 1980 Troa Cho  Alfredo De Vido; New York City in J.G.T., "Playful Enterprise: Architect Alfredo De Vido Converts the Ground Floor of a 19th-century Manhattan Townhouse into a Clothing Boutique," Interior Design 54, no. 9 (Sept. 1983): 254-55; PhotoCrd: Paul Warchol; LeSportsac  Carr & Associates; New York City in A.L., "LeSportsac: Carr & Associates Increases Sales in a Small Greenwich Village Boutique," Interior Design 55, no. 2 (Feb. 1984): 210-11; PhotoCrd: Sandra Williams; Creeks Boutique  Philippe Starck; Paris, France in Karen D. Stein, "In the Pink," Architectural Record: Record Interiors 174, no. 9 (Mid-Sept. 1986): 128-33; PhotoCrd: Tom Vack with Corrine Pfister / 1990 Niessing  Toshiko Mori, AIA; New York City in Edie Lee Cohen, "Niessing: On Madison Avenue, a New Genre of Jewelry Store by Toshiko Mori, AIA," Interior Design 61, no. 12 (Sept. 1990): 186-89; PhotoCrd: Peter Paige; Tiffany & Co.  Cross & Cross, Renovated by Haines Lundberg Waehler; New York City in Kristen Richards, "The Sparkle of Quality: With A Passion for Excellence, Tiffany & Co. Proves Fine Design Comes Wrapped in a Blue Box," Interiors 150, no. 5 (May 1991): 120-31; PhotoCrd: Elliott Kaufman; Holt Renfrew  Naomi Leff; Calgary, Canada in Edie Cohen, "Naomi Leff: With Updated Shops Throughout Canada and a New Store in Calgary, Holt Renfrew Reclaims Its High Fashion Status," Interior Design 65, no. 4 (Mar. 1994): 122-27; PhotoCrd: John Hall; Niketown  Nike Design Team (architectural, media, and conceptual design); Brian McFarland, Michael LeClere; BOORA Architects; New York City in Virginia Kent Dorris, "Nike's Flagship Store Integrates Architecture into an All-Encompassing Brand-Reinforcing Experience," Architectural Record: Record Interiors 185, no. 3 (Mar. 1997): 100-103; PhotoCrd: Steve Hall, Marco Lorezetti/Hedrich-Blessing / 2000 Alexander McQueen  Azman Owens; London, England in Suzanne Trocmé, "Metamorphic McQueen: Azman Owens Creates a Flexible, Theatrical Stage Set for Designer Alexander McQueen's First Freestanding Store in London," Interior Design 71, no. 5 (Apr. 2000): 172-83; PhotoCrd: Keith Collie; D'Fly  Kevin C. White Architects; New York City in Leanne B. French, "Nuanced Lighting at D'Fly in New York City Casts a Glow Upon Jewelry in a Sleek Setting Fit for James Bond," Architectural Record 190, no. 11 (Nov. 2002): 238-42; PhotoCrd: James Wilkins; Marni  Sybarite; Tokyo in Benjamin Budde, "Sybarite's Delight: At the Marni Boutique in Tokyo, Sybarite UK Played With Bewitching Signature Elements," Interior Design 78, no. 12 (Oct. 2007): 262-69; PhotoCrd: Jimmy Cohrssen; Christian Dior 2008] Peter Marino Architect; Paris, France in Mallery Roberts Morgan, "Dior, J'Adore: Peter Marino Updates the Original Paris Boutique with Elegance-and Cheek," Interior Design 79, no. 2 (Feb. 2008): 162-69; PhotoCrd: Jimmy Cohrssen. 2) Malyak, Kristi. Vitrine, "Theory Studies: Archetypical Retail Practices in Contemporary Interior Design," M.A. Thesis, Cornell University, 2011, 232-95.